A Downtown Brooklyn, NY Dentist winner of the Patients' Choice Awards. 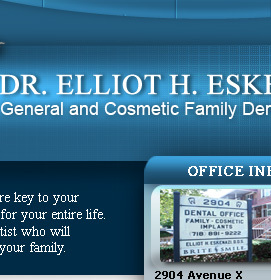 Below is a short video for Sheepshead Bay, Brooklyn Dentist Dr. Elliot H. Eskenazi. If you have any questions please call during our office hours. 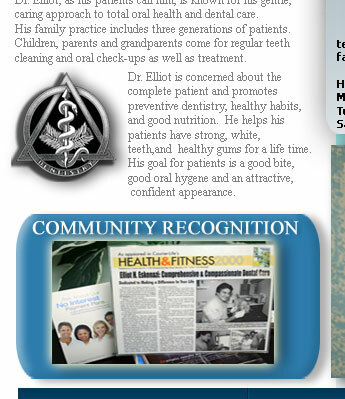 Dr. Elliot H. Eskenazi, Dentist in Sheepshead Bay, Brooklyn 11235. Hello, I'm Doctor Elliot Eskenazi, a cosmetic, general family dentist in Sheepshead Bay, Brooklyn 11235(near Brighton Beach, Manhattan Beach, Marine Park, Mill Basin, Gerritsen Beach, Bay Ridge, Gravesend.) Patients come from all areas of Brooklyn and also Staten Island, Manhattan, Queens and Long Island. After graduating from New York University School of Dentistry I opened my dental office in the neighborhood I grew up in and I've been here ever since. Sheepshead Bay, Brooklyn is my home. I am proud to say that I am truly a family dentist. Patients who were children when they were first brought to the office by their parents are now bringing their children and their parents for visits to the dentist. The biggest changes over the years are in the areas of dental technology. It's been exciting to continue to learn and improve the dental services that I provide to my patients. I'm proud of the modern and stylish comfort that patients enjoy in my Sheepshead Bay office. What hasn't changed are the reasons I believe what I do as a dentist are important. First, when I check on a patient I am looking at their entire mouth and checking for oral cancer. That's important, even if most of my dental patients never think about it. Second, oral health and teeth health is of life long importance. Teeth have an impact on a persons diet, from nutrition to how much they enjoy meals. Third, my dental patients do sometimes have teeth issues that can be uncomfortable or painful. Chipped teeth or tooth decay are just a couple of examples. Caring for them at these times is important. If I can be of dental help to you please give my office a call during office hours and schedule an appointment. 1.The best dentist anywhere. Dr. Eskenazi was able to fix my many dental problems without implants, periodontal work, etc. which I had previously been told were absolutely necessary. He saved me an incredible amount of money not to mention time, stress and pain. The staff is great and very friendly. 2. 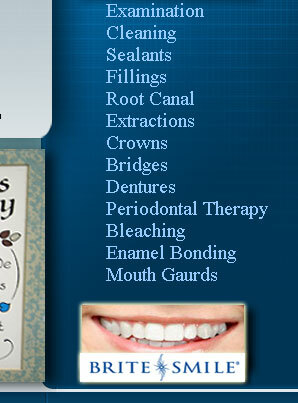 Dr. Eskanazi is an amazing dentist and has been our family dentist for over a decade. He has a truly wonderful manner and personality and really makes you feel comfortable. He always makes himself available to his patients and is reachable in emergencies. People of all ages go to Dr. Eskanazi and he takes care of everyone. He is highly competent and highly professional. Recommended!! 3. Best doctor in the the town. 4. Doctor Elliot is my family dentist. (Both my parents, before they moved to Florida, my wife, myself, and my two daughters.) He is also the dentist of my poker playing buddies, and half the dog run members. We like the quality of the work and the relaxing atmosphere. He runs a punctual practice so appointment schedules are followed and I never wait long. 5. I just came back from a teeth cleaning. I feel my teeth and gums tingling with cleanliness. They didn't find anything that needed care this time. That's good news. I actually look forward to visiting my dentist. 6. I was referred to Dr, Eskenazi by my neighbor. My front teeth were chipped badly in an accident and were bonded repeatedly by 3 different dentists. They looked good for a short while but contiually chipped and looked horrible. Dr. Eskenazi explained why the teeth were chipping and how my bite needed to be changed. He was calm and very re-assuring and I felt totally comfortable with him and his staff!! He put porcelain crowns and porcelain veneers on my front teeth which were amazing looking. My teeth are now beautiful and I smile big all day!! Dr. Eskenazi is very compassionate and does beautiful cosmetic work and that's the reason I'm spending the time to write this review. 7. He is the best. I had a total fear of dentists my whole life. He helped me over that fear. He is gentle, kind, and an overall great dentist. His office staff also, is the best, friendly and helpful. 8. He is an outstanding dentist. I don't have the words to describe the quality of care I have received from him. 9. Our family dentist. Even after I moved out of Brooklyn, I come all the way back just to go to Dr. Eskenazi. 10. Very caring DDS and staff. Made me feel comfortable and confident. Totally painless root canal and my cap was perfect. 11. 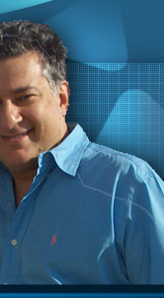 Dr. Ezkenazi is a perfectionist who does excellent work. He is very sympathetic and always concerned about the comfort of his patients. 12. Was extremely anxious before going to Dr. Eskenazi. Upon arrival, his staff were most accomodating at making me relaxed. 13. Entire experience outstanding..from front desk, hygienest,assistant and Dr. E !! !...his cosmetic work is beautiful !!! 14. Dr. Eskenazi and his crew make a patient feel like royalty. They are all wonderful. My mom went to Dr. E. when she was 92 years old. 15. Dr. Eskenazi takes great care into knowing his patients and takes pride in his work. He makes the dental experience a pleasant one. 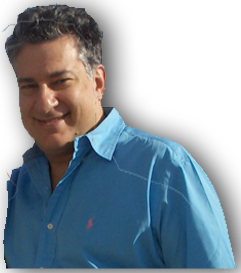 Dr. Eskenazi grew up and practices dentistry in Sheepshead Bay. Here is an excerpt from wikipedia on this wonderful Brooklyn neighborhood. Sheepshead Bay is a bay separating the mainland of Brooklyn, New York City, from the eastern portion of Coney Island, the latter originally a barrier island but now effectively an extension of the mainland with peninsulas both east (the neighborhood of Manhattan Beach) and west (the neighborhoods of Coney Island and Sea Gate). The mouth of the bay is about 1.0 mile (1.6 km) southwest of Marine Park, Brooklyn. The name Sheepshead Bay also applies to the neighborhood north of the bay, not just the bay itself. Sheepshead Bay is named for the sheepshead,an edible fish once found in the bay's waters. Even though it is rare, the fish can still be caught in the local waters every once in a while. The bay itself was originally the easterly entrance to Coney Island Creek, but filling of the central part of this waterway during the 1930s in conjunction with construction of the Shore Parkway portion of the Belt Parkway eliminated access to the creek. At the same time the bay was widened at its western end, deepened and bulkheaded. It is now the home of recreational fishing fleets. The fishing fleet has been shrinking every year and is being replaced by dinner boats. At the western end of the bay, there is Holocaust Memorial Park, which is used throughout the year for commemorative events.